There are electrical signals in the nervous system, the brain and throughout the human body and there are tiny magnetic fields associated with these signals that could be important for medical science. Researchers from the Niels Bohr Institute have just developed a method that could be used to obtain extremely precise measurements of ultra-small magnetic fields. The results are published in the scientific journal Nature Physics. The tiny magnetic fields are all the way down on the atomic level. The atoms do not stand still, they revolve around themselves and the axis is like a tiny magnetic rod. But the axis has a slight tilt and as a result the magnetic rod swings in circles. To measure a swinging object you need to have both its position and the speed of the oscillation. But in the world of atoms, the laws of classical physics from the world as we know it do not apply – here the laws of quantum physics rule. Heisenberg and Bohr’s laws of quantum uncertainty relations state that when one measures a system, you cannot simultaneously measure the position of a particle and its speed and get a precise number. You can measure one of these variables, for example, the position and get a number with almost unlimited precision. In the same measurement, the speed of the particle would then be uncertain. If you measure the precise speed of the particle, you would then get an uncertain position in the same measurement. Likewise, the laws of quantum physics state then when you measure a rotating motion, you cannot simultaneously measure the rotational speed and direction of the rotational axis. 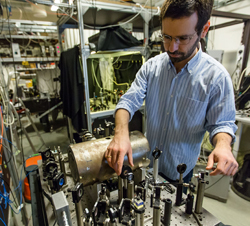 Georgios Vasilakis, a postdoc in Quantop working on the experiments in the quantum optics laboratory. Here, the researchers have a tiny glass tube that contains a cloud of billions of caesium atoms and using laser light, the tilts of all of the atoms are turned in the same direction and you can calculate the ultra-small magnetic fields with great precision. 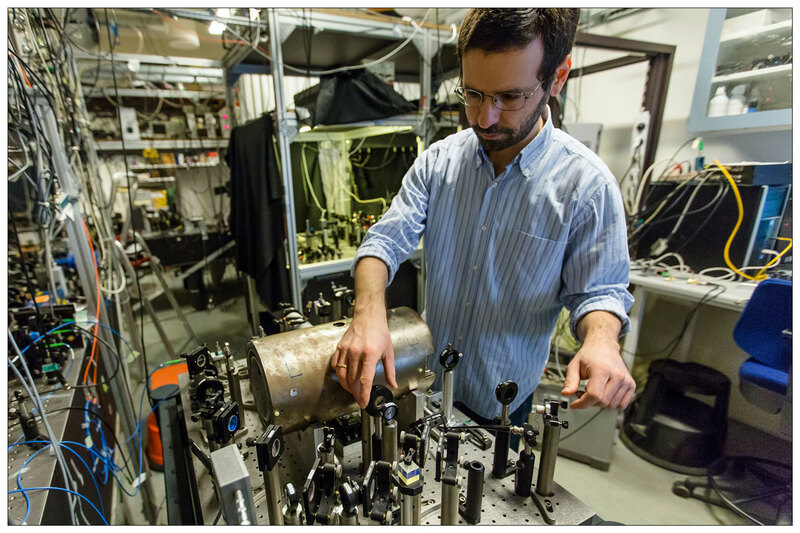 “To get accurate measurements of ultra-small magnetic fields, we have devised a way to almost escape the limitations of quantum physics and we have conducted experiments in the laboratory where we improve the measurements of the oscillating atoms. 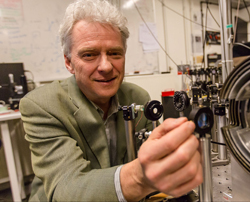 The newly developed sensor that can measure the ultra-small magnetic field is comprised of a collection of atoms in gaseous form,” explains professor Eugene Polzik, head of the research group Quantop at the Niels Bohr Institute at the University of Copenhagen. In the quantum optics laboratory, the researchers have a small glass tube that contains a cloud of billions of caesium gas atoms. The glass tube is 10 millimeters long and has a diameter of only 300 micrometers (a micrometer is one millionth of a meter). The atoms revolve around themselves on a tilted axis, but the gas atoms are flying around helter skelter and the tilted axes of the atoms are oriented in all possible directions. Using laser light, the tilts of all the atoms are turned in the same direction. This direction could be knocked off course when the atoms crash into the glass wall, but the glass tube has an inner coating that ensures they hold course. Now the researchers send a new beam of laser light with a different frequency into the gas atoms and then a strange quantum phenomenon takes place, the light and the gas atoms become entangled. The fact that they are entangled means that they have established a quantum link – they are synchronised and are now totally aligned. The laser light is sent with a certain pulse and you can now measure the direction of the atomic axis, but only one direction. This means that when the atoms revolve around themselves, its tilted axis forms a circle and you cannot measure the precise position of the entire circular swing of the axis. But you can divide a circle into a north/south direction and an east/west direction. 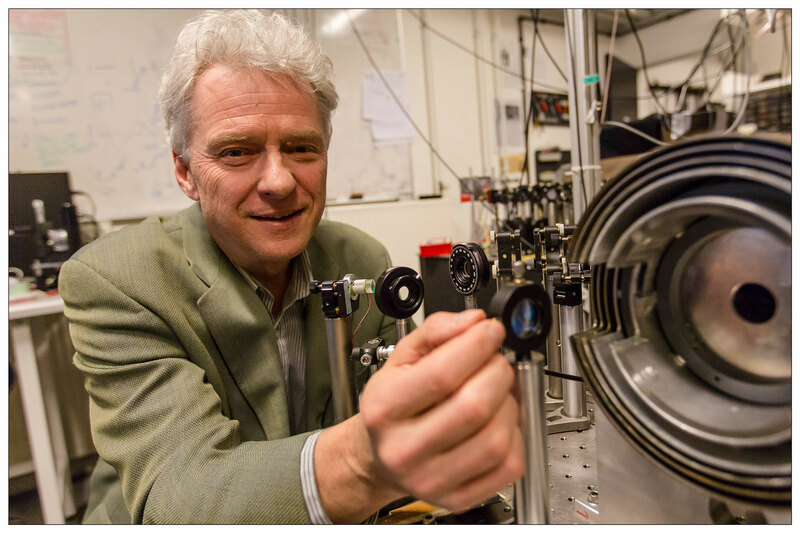 The newly developed sensor that can measure the ultra-small magnetic fields is comprised of a cloud of billions of caesium gas atoms in a tiny glass tube. Using laser light, the tilts of all of the atoms are turned in the same direction. “What we then do is measure one of the directions, for example, the east/west direction. This is called a squeezed state and this can be measured with very little inaccuracy. This is very useful, because for many measurements of external magnetic fields it is only necessary to measure the east/west direction and thus we can calculate the ultra-small magnetic fields with high precision,” says Eugene Polzik. Super sensitive measurements of tiny electromagnetic fields and forces are important in relation to research in biology and medicine and the research group therefore has a collaboration with the doctors at the Faculty of Health and Medical Sciences at the University of Copenhagen.